Welcome to the Chicago Chapter! The Chicago Chapter is the oldest chapter in the 82nd Airborne Division Association and serves the Airborne community across the greater Chicagoland area. We are an all-Airborne organization with more than 200 members ranging from WWII veterans to recently separated paratroopers. Membership is open to anyone who has earned US military jump wings or has served with the 82nd Airborne Division. Chicago Chapter members Jose Palacios and Ken Negley. Chicago Chapter - 2019 Calendar published! 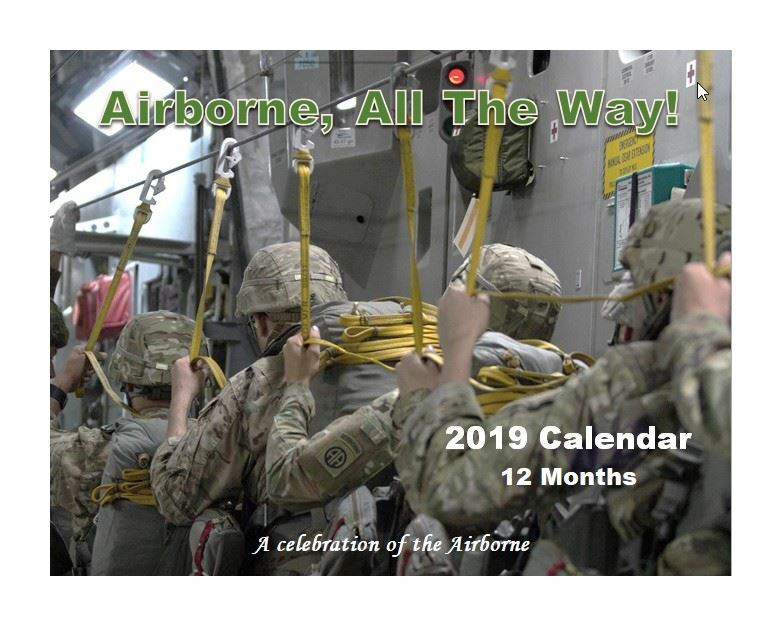 Enjoy 12 months of Airborne imagery, loaded with Airborne/military dates you won't find anywhere else. Visit our eBay store to buy yours and one for a buddy! Just $15 each, with proceeds benefiting the chapter and our annual goals. "Chicago Chapter, 82nd Airborne Division Assn. ", a 501(c)4 non-profit organization.